One of the many awesome things CS Lewis said was this: When I became a man I put away childish things, including the fear of childishness and the desire to be very grown up. Which is a slightly self-conscious way for me to ‘fess up to the fact that—since becoming a grown up—I’ve acquired a pretty impressive collection of plush animals. I could probably trace this back to childhood trauma (only in the sense that you can trace everything back to childhood, not in the sense of being actually at any point traumatised) but basically I think it comes down to the fact that … they’re really cute. So, yeah, you’re probably looking at that thinking “okay, right, it’s some cute animals, what’s he getting so excited about” but keep looking … spotted it yet? Bottom row, fourth from the left there’s … yep … that’s a pineapple. I would totally love to be have been a fly on the wall in that design meeting. Manager: Okay team, we’re introducing a new range called Bobballs. The concept is adorably spherical animals. What have you got for me? Manager: Nice work, Michelle. I imagine that’ll be really popular because the second Finding Nemo film just came out. Manager: Okay Imran, I see what you’re going for there. It mean it’s very inside the box but kids always love tigers. Good call. Designer 3: I made this … yellow bird thing, could be a chicken, could be anything avian to be honest, but it’s got a hilarious look on its face. Manager: You know something, Helena, I’m going to trust on you on this. I love the suppressed madness in its eyes. What about you, High-As-A-Kite Bob? What have you got for us? Bob: Yeah, man, a wild pineapple, king of the beasts. They also do a range called Pippins, which I don’t think Bob was involved in, the design principle of which simply appears to be: so cute it hurts. Anyway, I was recently on Amazon where my ‘inspired by your shopping trends’ is almost 100% cuddly animals and romance novels. And up popped this adorable duck. Omg, looook at her! Loooook! With her chubbly duck cheeks and whimsically uptitled duck beak. And the little duck feet – omggggg. She looks like Charlotte Lucas from Pride and Prejudice if Charlotte Lucas was a cuddly duck. So, obviously, being a mature adult I had to have her. Thus, I felt no particular qualms as I ordered my adorable cuddle duck. And then my duck arrived. Here is a picture of my duck. Yep. She hates me. She hates everything. She is the angriest duck in the universe. A duck with a grudge. A duck you would not turn your back on. Or allow to approach you down a dark alley in a dodgy part of town. I ordered an adorable duck from you, but the duck arrived hateful. The description of the duck is listed as ‘soft cute cuddly’ but my duck would be more aptly described as ‘malignant sneery hostile’. Under the trade descriptions act, I believe I am entitled to a new duck. PS – Please do not tell the duck I have written to you, as I believe she will kill me in my sleep. Anyway, I brought the problem (and the duck) home to H – who promptly accused me of being mean to the duck, since apparently some people can’t help being hateful, and refused to let me return her. Obviously we couldn’t call her Charlotte Duckas any more – because while Charlotte has a wicked streak, she is not a psycho. So the duck was re-named Caroline Beakley, which seemed more appropriate. Although, honestly, day-to-day we usually call her Ducky. Her hobbies are going for walks, watching The Sopranos and playing Eldritch Horror. But I’m secretly glad I didn’t return her because she is much better than an ordinary cute-faced duck could ever have been. Or maybe this is Stockholm Syndrome. In any case, I think the moral of this story is that sometimes life will send you a really angry duck. And that is okay. And I love Ducky! I think she simply is misunderstood. I mean, no one that loves playing Eldritch horror could be a bad duck. Maybe I should get myself a plush pineapple to play Eldritch with me. Also, is that a tomato on the top row of round animals? Omgggg it is. Bob strikes again! Heheh, thank you. Beware of Amazon – I can lose hours, I tell you, hours looking at the cuteness. H also claims Ducky is misunderstood. Omg, you’re all in cahoots. This. Is. Hilarious. I’m on team misunderstood I’m often accused of looking mad. I’m glad you kept her. I wonder if there’s a return box full of misunderstood duckies they probably get turned into pineapples!! Chuckled my way through that – liked the embiggen and the elephants feeetts -and I’m sure I know someone who could use an angry cat plushie . I have plush owls (including a hedgewick) which whilst you would expect them to be scarier then ducks,manage to continue being cute. My mother has an Australian animal plushie collection – everyone buys toys for their mothers 95th birthday -yes ? I have a plush owl as well (also by Keel if I’m not mistaken) but he has a bent beak and so looks incredibly anxious – now I think about, I do seem to collect plushies with weird expressions. Oh come on Alexis, who wouldn’t want a koala, a platypus and a kangaroo toy? Although maybe there is a market for cute little crocs and furry funnel web spiders, what do you think? As someone who had relatives who lived in Australia, and consequently owns quite the Koala collection, I approve this message. Awww, you are clearly very tender-hearted when it comes to angry Duckys. Haha. Yes. Having children or knowing me is a surefire way to get your home filled up with cute, cuddly animals. Thanks for sharing Ducky, and the story of her wending her way into your heart, it is a beautiful love story (and also very cute). I think Ducky is appreciating all this love. Well, it’s hard to tell. But in her heart, I’m sure she appreciates it. I was wondering how she is getting on with the rest of your collection? Anything noteworthy? Are there jealousy issues? Is Ducky bossing them about? I’m not sure if Ducky’s issues are unresolved so much as … right there and in your face. She mostly hangs out with H so the rest of my collection aren’t in too much danger. It’s pretty spread out across the house as everyone as their own little group and preferred place to be (I have an octopus who lives on one of my bookcases, for example). She sort of has a minion/nemesis in Nowl, who is an anxious-looking owl who hangs out on the sofa – she manage to get H to knock him off with a pillow the other day. H claims an accident but I’m not sure… IT’S ALL VERY SUSPICIOUS. Don’t judge, Ducky! Maybe she just needs some love! But…what is the second creature in on the 4th row? It is pink and not a pig and I am so confused. I am also disappointed in the lack of hippo, but I think the pineapple makes up for it. Oh wow, I have no idea what the … smiling pink blob creature is it. Another Bob Special? 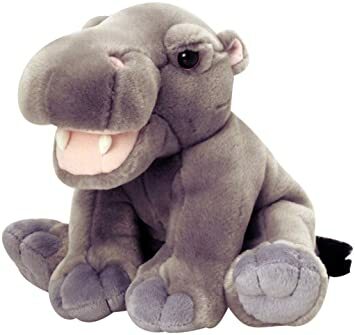 It bears the question, do you have a hippo or not yet? Because these two are adorable, especially the first one. Yay – glad you had fun with my mean duck ! I only own one plush toy and I ended up with it because, years ago I worked in an office that frequently got donations to give to children. We received a huge bag of soft toys and all the people with children on their caseload dug through it and took the toys they wanted, until finally there was just this one, ugly stuffed doll left. It was an aardvark, with weird spiky brown fur and an overly long beak. I had no children in my load, so I’d ignored the stuffed animals. 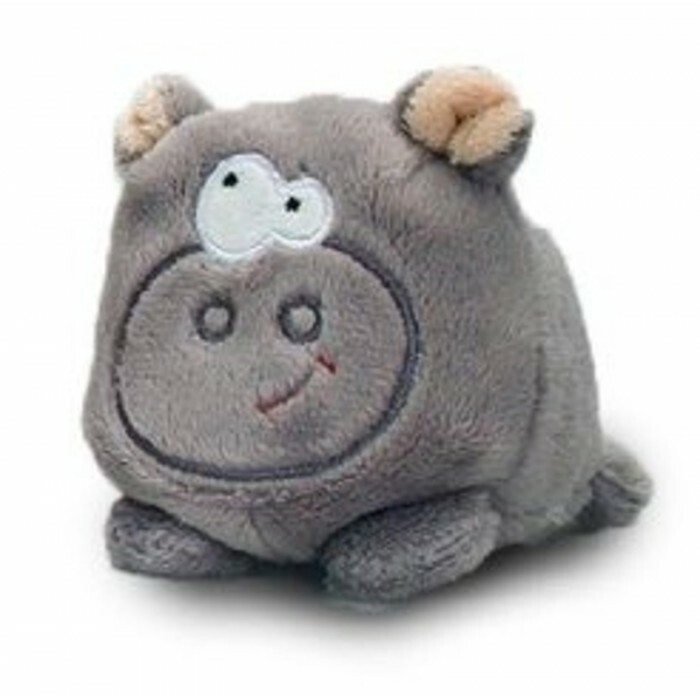 But I’d passed the cubical with this one toy laying forlornly at the bottom of a black plastic bag several times and eventually I couldn’t take it anymore and claimed the ugly aardvark for my own. I’ve had him something like 15 years now. He doesn’t thank me for rescuing him and I don’t make him feel he should have to. 3. Do you know of giantmicrobes.com/uk/? They are fantastic! I also never thought I’d say things like “I just really want to have herpes!”, but here we are. This post made my morning:) I have to admit I’m a total sucker for adorable plushies. I think Ducky has character…even if it is tiny rageful duck. I hope all the other friends are counted and accounted for every morning. Just in case. I’m now ever so slightly hysterical with mirth in public. I don’t need a scary duck, I have my son who’s glaring daggers at me (he’s really cute from other angles too), who really doesn’t give a crap about the damn duck (he would if it was a hamster). OMG 😀 This is hilarious. I laughed so much, I annoyed J who’s trying to concentrate and play the piano. As always, you are adorbs and lovely. Thank you for sharing your awesomeness with the world. Oh I totally empathise with this confession. I still have the teddy bear, which I had as a very small child – my Mum collected Heinz tokens to get him for me. He is very fragile now, with his head on a slant and many times repaired, but he still has a place in my heart and in my bedroom. I seem to have passed this onto my son, who is also a ‘grown up’ and recently bought Gus the turquoise penquin Beenie Baby (re-christened Artichoke) to take on his travels. He is going to Capetown soon and promises photos of Artie on Boulders Beach with his RL counterparts. I hope that Ducky retains your affection for many years to come (ie forever). It’s got award winner written all over it. I feel affinity with Ducky. Apparently I’m in an Angry Duck phase at the moment. Also… I still sleep with the teddy bear Bones gave me when we were in college. Ohh, maybe I just solved the “Mystery of the Downturned Duck Beak”! I think it was supposed to curve up, but it curves down, so maybe they just attached it upside-down? Poor Charlotte/Caroline! Looks like they built her with her beak on upside down. Like a birth defect. So glad she ended up waddling her way into your arms. You’ve opened up another new world to me! Where else could I find plush snakes or sloths? i am glad I didn’t know about Keel toys when my children were little, I can see myself buying them toys instead of food. This was hilarious! I like to envision you sitting at the computer deciding which is the plushiest of all. Hopefully Ducky’s crazy eyes are just a RBF and really Ducky is wishing someone would just see the inner duck. HILARIOUS!!!! I’m glad I’m the only one home right now. I laughed and smiled all over the place. Plus, I just wasted an hour looking up Bobballs and stuffed animals on Amazon. Then I started thinking about the stuffed toys I have in the house. Two girl bunnies my grandmother made plus the clothes they wear, a lamb with long skinny legs (I bought one for my step-granddaughter when she was born then bought an extra for me; that was 16 years ago), a teddy bear (I bought one for my great-niece when she was born and another for myself a year ago) then realized I have a total of 5 stuffed toys I bought duplicates of when buying one for someone else. Hmm. I may have an issue there that needs looking into. Aaaannnnddd I’m still smiling. Now I have to go back and read this post again and everyone’s comments. Best entertainment I’ve had in a while (not counting books). Beats tv any day. Love your wit, Alexis. It’s raining outside but this brought sunshine into the house. Love ya!!! 1a) There are also PvZ stuffies. I gave my son a squash. 2) My mom used to have a stuffed beaver named Howard, with the most glorious soft tail. She would loan him to people she thought needed comfort. (Sadly, one of those people died, and he is now gone for good.) But after one such loan, Howard came back… strange. With an expression on his face as if he’d seen some eldritch horror. (Not the game.) We always wondered what he went through on that trip. That is adorable! I haven’t watched the whole thing yet, but yawning plants FTW! I re-read this twice and laughed even harder the second time around. I would love to be in on those design meetings. More importantly, I’m glad that you and Ducky have come to some sort of peaceful coexistence.